If you have a vitamin D deficiency or are borderline, then it is important you do all you can to raise those levels of this vital vitamin. The sunshine in the UK may not be enough alone if you are diagnosed with a deficiency and your bone’s health depends on ensuring you have good levels of Vitamin D. You can choose to take a supplement or may be prescribed one but you can also make positive changes to your diet to bring in more of this essential vitamin which is also important for the absorption of other essential vitamins and minerals such as iron, zinc, magnesium and calcium. Probably the best food there is for Vitamin D, with wild salmon coming out right on top. Half a fillet of fresh salmon provides more than the recommended daily intake amount for one person. Two large eggs, preferably free range, will provide around 12.5% of your daily recommended dose of Vitamin D and they’re very easy to work into your diet and enjoy. Most the cow’s milk sold in supermarkets today is fortified with Vitamin D and there are also other dairy products such as yoghurts which has been fortified, making it even easier to give yourself a boost. 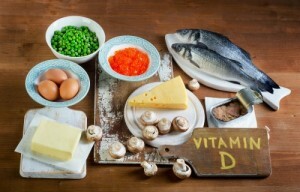 Tinned fish, such tuna, sardines or mackerel contain a good dose of your recommended Vitamin D intake. In fact, tuna contains over 25% of your recommended daily amount. Adding a handful of mushrooms do your meal, especially those which have been grown in direct sunlight, will certainly ensure your vitamin D intake is going in the right direction. Just like milk you’ll find most cereals sold in supermarkets have been fortified with vitamin D to increase our intake. Check the labels but you’ll often find it is cereals aimed at children which have the highest vitamin D levels. If you’re thinking about vitamin D and not too worried about fat content, then pork ribs are a great choice. Pork ribs are rich in vitamin D, as are our other pork cuts but it is the ribs that come out on top. Orange juice is often fortified too so look out for labels and if you have a single cup of fortified orange juice it will contain much more vitamin D than your average cup of fortified milk. 20% of an average block of tofu is packed full of vitamin D and there are plenty of ways you can incorporate tofu into a meal and flavour it to ensure it tastes great. Ricotta is the stand out star when it comes to cheeses as it has a much as 5 times more vitamin D than the others so it’s got to be your number one cheese choice when looking to boost your vitamin D intake. To make an appointment with Dr Stephanie Barrett please just get in touch.